Tunesday: You don't need to be a Pirate. Remember the days when you had to have perfect timing and a blank tape to steal music? You would hear your favorite song come on the radio and hit the record button, usually missing the first 5 seconds of the song, and when you listened back the transition between songs was choppy and abrupt or you would end up with a radio announcer's voice stuck forever between two of your favorites. Back then, to steal music required work and determination. It wasn't illegal, it was an art form. 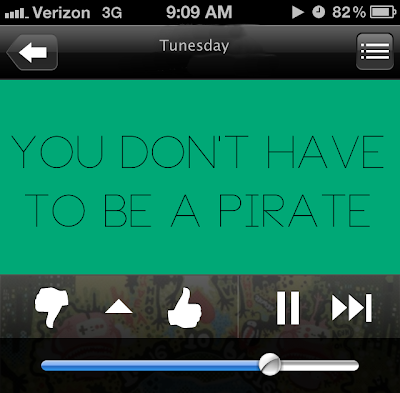 No one would call you a pirate, just a fan. My point is that with the excitement of file-sharing, we all turned a blind-eye to the moral and literal rules against it. I'm not going to preach about how right or wrong it is. I was guilty of it too. It was because of the ease of getting new music that I became such an enthusiast! Most of the music I loved wasn't being played on the radio. So if I heard one song somewhere and I wanted more, I had to cough up the cash. Forget it. I could get the whole album right online in less than 20 minutes for free. If I didn't like it, I deleted it. If I liked it, I told my friends. I figured I was making up for what I wasn't paying. But this post is about NOT stealing music, isn't it. Oh shoot. What I really mean to say is this...illegally downloading music may be convenient (unless you get caught) but where is the gratification? What happened to the good ol' days when you earned the music you got to enjoy, even if you weren't paying cash for it? A couple years ago, I chose to give it all up and vowed to never steal music again. Okay, that's not true. What happened was I lost my hard drive in my last computer, and all of my music was gone too. I had to rebuild my music library from scratch. Everything I did buy on Amazon or iTunes was still available for me to re-download. (Isn't that handy?) But when I sat down to my new computer, I just chose not to even visit any of those scary sites again. I felt more gratification knowing that I would have to work to get it all back, bit by bit. Not to mention, I didn't listen to half the crap in my old library. I had so much junk in there that I didn't actually care about. Now, I was determined to build the ultimate collection of music I loved, piece by little piece. They have more than books. They actually have CD's too, and not bad ones either. I'm convinced my indie-rock soul mate was in charge of ordering music for the Fort Rucker library because they have all of DCC, Radiohead, The Shins (AND Broken Bells), Japandroids, and many more. My jaw dropped the first time I went and found Grizzly Bear next to Kenny G. Yes, the idea is that you borrow the CD for a week or two, enjoy it, then return it. But you know sometimes you listen to it on your computer, and sometimes iTunes wants to import it into your library, and you can't help that, can you? And since most libraries limit 2-3 CD's at a time, you have to go back to library often, so society wins in the end, I think. I don't know the exact laws on how many times one CD can be imported to different computers, but hey, that's technology. So, if your friend wants to share a CD with you, who are you to deny them that? If that friend doesn't live near you, that friend could always lend you said CD through services like Dropbox. Rather than getting the album from some unknown source across the globe, you're getting it from someone you know who recommends it. It means a little more. We really are riding that fine line of the piracy law, aren't we? Spotify is a legit and completely legal company that allows you to listen to nearly anything from start to finish, even brand new stuff. The only catch is that you have to listen to it from your computer or pay a fee to get it on your phone. But seriously, who's not glued to their computer most the time anyway? You are right now. Oh and there's ads between songs sometimes. So worth it. I bought some albums over the summer for like a buck a piece. Good albums too, like Gotye and Lana del Rey. Every month, they have a hundred albums on special for $5, but there are like a million for less than that. Every day is a new deal, and there is even a sampler pack of free songs from up-and-comers. If I can't find an album at the library or through a friend, and I really want to own it, then I'll buy it on Amazon. I've found Amazon is cheaper than iTunes. Like I said, once you buy it online, they keep track of that and even after you switch computers you can download it again. I think there is a limit, so you can't just give it to everyone. So, that's mainly how I get my music. I always try to promote my favorites on the blog, and you know if I could attend concerts, I would. But sadly I live in a remote country town, so my wallet will thank me until we get to a bigger city. Honestly, I just think there has to be a better way than risking viruses on some sleazy file-sharing site. The music deserves better than that. So, let's hear it. Are you a pirate? How do you get new music? Anyone out there still buying CDs? I don't listen to music straight from the album as much as I used to, but (like you) I have also vowed to work for what I do get. I purchase digital albums from Amazon (deals are so much better!) and listen from the Amazon cloud player app on my phone most of the time. WAY WAY WAY back, I could pirate with the best of 'em, but I'm not doing that any more- too much risk for too little gain if you ask me. Less is more. So true! I have a Mac and viruses still scare me. Plus, I hear those horror stories about someone going to jail for downloading music, which i think is ridiculous, but still scary. Ohhh, great post! You know, I don't like pirating and I feel guilty each time I do it. Usually if I'm trying a new band I will get a few things free, but I will almost always buy if I turn into a big fan. My iTunes purchase-list is VERY long. I still buy CD's. I ask for CD's from labels too and review them, if I really want a physical copy but can't afford it. I try REALLY hard not to pirate, but if I'm strapped for cash sometimes I'll bite the bullet. That being said I've done a really good job of limiting the number of CD's I download free of charge because I always feel better about paying for it. And I've made sure to do a lot of spending at concerts too, ha :) That's where artists make the bulk of their money anyway. Merch! Another great site for free music is Noisetrade.com You exchange your email address and zip code for free downloads. There's everything from up and coming artists to established artists like Aimee Mann giving away free samplers from upcoming albums. Haha I definitely remember missing the first five seconds of every song when I tried to make mix tapes. So sad. :( Now I just use Pandora all the time or listen to old music on my iPod (most of which was—yes—downloaded illegally).